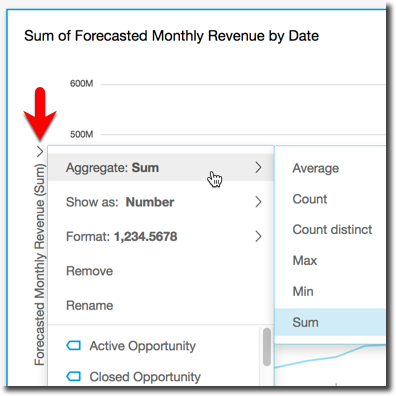 Average – Calculates the average value for the selected field. Count – Provides a count of the number of records containing the selected measure for a given dimension. An example is a count of Order ID by State. Distinct Count – Provides a count of how many different values are in the selected measure, for the selected dimension or dimensions. An example is a count of Product by Region. A simple count can show how many products are sold for each region. A distinct count can show how many different products are sold for each region. You might have sold 2000 items, but only two different types of items. Max – Calculates the maximum value for the selected field. Min – Calculates the minimum value for the selected field. Sum – Totals all of the values for the selected field. All aggregate functions can be applied to numeric fields. Count is automatically applied to a dimension if you choose to use it in a field well that expects a measure. If you have used a dimension in that way, you can also change the aggregate function applied to it. You can't apply aggregate functions to fields in dimension field wells. The visual elements that support aggregated fields varies by visual type. 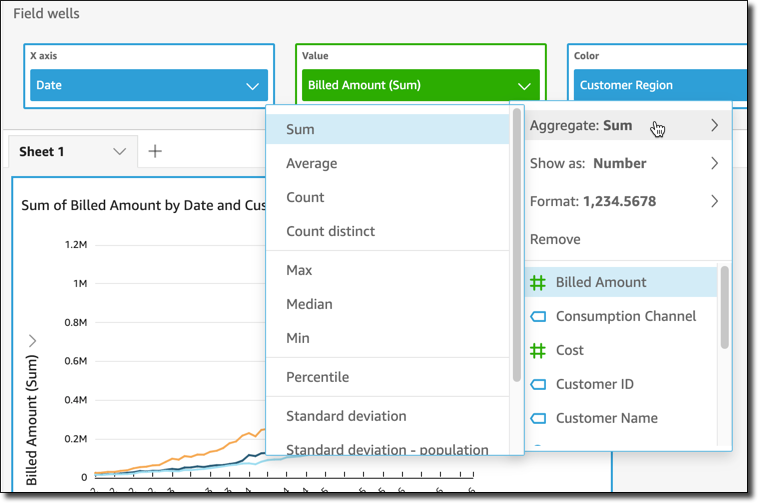 Use the following procedure to change or add aggregation on a field. On the visual, choose the on-visual editor for the field that you want to apply aggregation to. On the on-visual editor menu, choose Aggregate, then choose the aggregate function that you want to apply. Use the following procedure to add aggregation to a field for a pivot table visual. Expand the Field wells pane by choosing the expand icon. Choose the field well containing the field that you want to apply an aggregate function to. On the field well menu, choose Aggregate, then choose the aggregate function that you want to apply.